The WRS provides modest lifetime benefits to former public employees and their beneficiaries. Benefits are paid from monies contributed by employers and employees during the person’s working career plus investment earnings on the accumulated contributions. Initial Benefits are based on the person’s working career (DB) or investment experience (DC). When was the WRS created? in 1982 to create the WRS. Help public employees protect themselves and their beneficiaries against the financial hardships of old age, disability, death illness and accidents. Promote the state's economy and provide efficient service to the public by attracting and retaining competent employees. Both are independent, non- partisan agencies. Members of the boards that oversee the agencies and all agency staff are fiduciaries. This means they are required to make all decisions solely for the benefit of the trust funds. Board members and staff may not make benefit or investments decisions for personal or political reasons. The boards and staff are required to administer the assets for the purpose of the fund. What makes the WRS unique? • Contributions are paid during the employees’ working careers. •Financial responsibility is NOT passed to the next generation. • Everyone – including employers, employees and retirees – shares the risks and rewards. It’s consolidated for efficiency and reduced cost. Nearly all WI public employees, with the exception of most Milwaukee County and City employees, participate in the WRS. An independent actuary annually reviews the pension fund’s financial status and recommends contribution rates to the ETF Board. Both public employers and employees pay contributions during the employee’s career. Retirees do not receive automatic cost-of-living increases. What exactly is a Defined Benefit (DB) pension plan? There are key elements of a DB plan that set it apart from a more common DC plan or 401 (k) plan. With a DC plan the employee is alone in making investment decisions and often suffers from making inappropriate ones. The initial benefit is based on the years of employment under the DB plan, final average salary (for the WRS the average of the employee’s 3 highest years of salary) and a multiplier. Benefits are paid until the employee’s death or, depending on the benefit chosen, the death of the employees beneficiary. Employers are responsible for making contributions to help fund the benefits. The WRS and some other plans also require employees to contribute. Investment professionals manage the assets and make investment decisions for the entire group. Nearly 80% of the income comes from investment returns. What is different about a defined contribution (DC) pension plan? Several differences exist between a DB and DC plan. • Responsibility for ALL contribution and investment decisions is shifted to the employee. In some cases, employers contribute as well. • Contributions to the plan are not determined by the employee’s future needs. • There’s no assurance the benefits will meet the person’s basic needs after retiring and until death. • Employers are “off the hook” after employees retire. Employer contributions are usually dependent on how much an employee contributes, not on what is needed to help fund an employee’s retirement. The WRS provides modest lifetime benefits to former public employees and their beneficiaries. It is one part of planning for retirement. Other parts include personal investments and social security. Costs to invest DC plan assets are about twice those of investing DB plan assets and are paid by employees in the form of fees. A 401 (k) is an example of a DC plan. I’ve heard about the Core Fund & the Variable Fund. What are they? • Core Fund – A diversified fund that covers all participants and is invested in stocks, bonds, real estate and other types of investments. • Variable Fund – A riskier, all-stock fund in which participants can direct half of the contributions paid by them and their employer. The Core Fund gains and losses are “smoothed” over five years & then applied to the accounts of employees, employers and retirees. This means only 20% of investment gains or losses are recognized for the year in which they occur. The Variable Fund may result in a person receiving a higher initial annuity, but it can also result in a lower annuity as the investment risks are higher. Investments are not diversified beyond stocks, and investment gains and losses are not smoothed. Instead, they are applied to employee and retiree accounts in the year they occur. As a result, risk is much higher. Over the last 20 years, Core Fund annualized investment performance (8.5%) has slightly outperformed the Variable Fund (7.9%). About 20% of WRS participants are in this fund, including some retirees who were in it while employed and have chosen to continue. Deciding to stay in the Variable Fund or opting out is a personal decision and depends on an individual’s age, lifestyle, other resources and ability to handle financial risk. How is the WRS funded? Public employers and public employees fund the WRS. Investment returns account for nearly 80% of the funds and keep contributions stable and relatively low. Contributions are based on a percentage of the employee’s annual salary. Monies contributed by the public employer to the WRS are part of the compensation paid to the employee. Currently, the law requires employers to pay 50% of total required contributions and employees to pay the other 50%. Did Employees Always Pay 50% of the contributions? 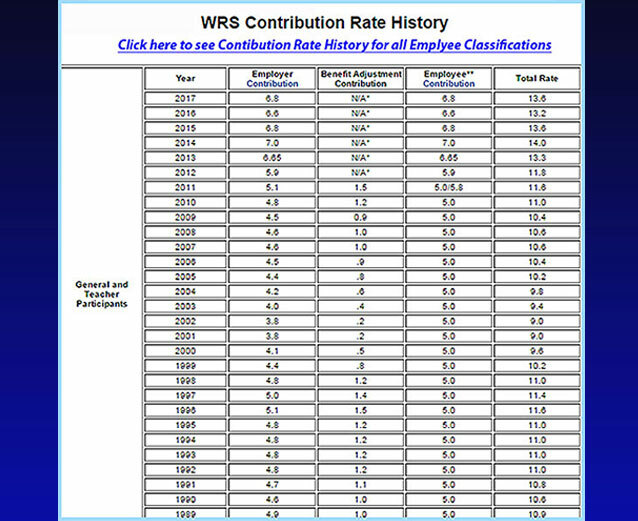 There has always been an “employee required” contribution under the WRS. Until enactment of 2012 WI Act 10, the employer could pay any or all of the employee’s required share. Over the years, employers negotiated with employees and paid virtually all employee-required contributions in lieu of giving salary increases. This was more advantageous (less costly) for the employer, as the employer did not pay Medicare or Social Security taxes on the WRS contributions. • prohibited the employer from paying any of the employee’s share. The action repealed nearly three decades of employer and employee benefit negotiations. How are contribution rates set? • An independent actuary and the ETF Board work together to establish contribution rates that help meet the system’s future needs. • Contribution rates are set to cover all benefits (liabilities) earned to date. Costs are not transferred to the next generation. • Employers and employees must pay the approved rates. The actuary annually reviews the WRS’ funding status and recommends the ETF Board adjust contributions up or down to keep the system funded on a long-term basis. The actuary uses a 7.2% estimate when calculating future contribution needs for the WRS. The ETF Board sets the contribution rates based on the actuary’s recommendations. Public employers deduct the employee-required contributions from the employee’s wages and submit them plus the employer’s required contributions to ETF. Because investment gains were good and employers and employees paid all required contributions when due, contribution rates have remained fairly stable during the last 25 years as shown on the next slide. Many other states did not pay required contributions and now face significant increases. Act 10 resulted in some unintended increased liabilities that recently increased contributions that totaled almost $88 million. • Employer Normal Cost is the employer-required contribution. • Participant Normal cost is the employee-required contribution. • Total Normal Cost is the total contribution paid by or on behalf of the employee. What happens to the contributions after they are paid? When ETF receives the contributions, it records them to two reserve accounts . . .
. . . all contributions are pooled for investment purposes and invested by SWIB. Employee Reserve: ETF maintains a separate account for each employee who has not yet retired. All employee-required contributions paid by or on behalf of an employee, plus investment earnings, are recorded in that account. Employer Reserve: The employer-required contributions, plus investment earnings on those contributions, are recorded in this account. When an employee retires, what happens to contributions the employer and employee made while the employee worked? • ETF transfers the contributions and investment earnings that accumulated in the employee account prior to retirement to the Annuity Reserve. • ETF transfers an equal amount from the Employer Reserve to the Annuity Reserve. • ETF calculates the initial annuity based on the present value needed to fund an annuity for the employee's lifetime and transfers that amount to the Annuity Reserve. Funds transferred to the Annuity Reserve, plus investment earnings, will pay an annuity for the remaining life of the employee or the employee’s beneficiary. No additional contributions (taxpayer funded) are added to the annuity reserve on behalf of WRS annuitants once they retire. When establishing the initial annuity, the actuary assumed that SWIB will always earn 5% on the combined employer/employee contributions that were rolled to the annuity reserve. Investment returns fund nearly 80% of the benefits paid to retirees. What do “Formula Benefit” annuity and “Money Purchase” annuity mean? • Formula Benefit: equals the years of creditable service earned times the average of the three highest salary years times a multiplier. • Money Purchase: equals the contributions and investment earnings that have accumulated in the employee's account during his or her working career and a matching amount from the employer reserve. Funds transferred to the Annuity Reserve will pay an annuity for the remaining life of the employee or the employee’s beneficiary. When establishing the initial annuity, the actuary assumes that SWIB will always earn 5% on the combined employer/employee contributions that were rolled to the Annuity Reserve. How is a retiree’s initial annuity determined? ETF determines what the annuity will be using the formula. It then calculates the contributions and investment earnings that have accumulated in the employee's account plus an equal amount from the Employer Reserve and determines what the money purchase calculation is. The employee's initial annuity will be the higher of the two calculations. This initial retirement annuity is known as the retiree's floor amount. Will the initial annuity ever increase or decrease? The WRS does not have an automatic cost of living (COLA) increase. But retirees can receive an annual dividend (or benefit adjustment) IF investment earnings exceed the 5% needed to fund the initial annuity amount for the person's lifetime. However, dividends granted in previous years can be rescinded IF investment losses occur. If this occurs, a monthly annuity will be reduced from what it was the prior year. Could my annuity ever go to zero? The Core Fund annuity will NEVER go below the initial amount received when the person first retired (referred to as “the floor”), no matter how bad the investment losses are. Because the Variable Fund portion of a person’s annuity is not guaranteed, that portion of the total annuity could, theoretically, go to zero IF stock investments were bad over an extended period of time. Part of the unique shared risk aspect of the WRS is that dividends/adjustments may be taken back to the original floor. An example of dividend / adjustment take back is shown on the next slide between 2008 and 2012. These losses reduced pension annuities of retirees that were previously above their original floor amount. The State of Wisconsin Investment Board (SWIB), invests the contributions, together with other accumulated WRS assets, in public and private financial markets. SWIB’s goal is to meet or exceed the public markets and the 7.2% that the actuary has determined necessary to fund the WRS over the long term. * Benchmarks are used to measure the Funds performance against the financial markets. The Core Fund benchmark is a composite of several market indices. Whereas, the Variable Fund benchmark is composed of US, International developed and emerging market indices. Is the WRS the same as other public pension plans? It has many similarities but is not the same. Contributions to the WRS have been paid when due. Many other public plans did not make contributions when the financial markets were good or their budgets were tight. Now, these pension plans are underfunded – some severely. Not all plans require employees to contribute during their working careers. Participants in other plans do not share in investment gains and losses. Retirees in some plans receive automatic cost-of-living increases and others receive no post retirement increase. Other plans do not have an optional plan similar to the Variable Fund. Not all public plans have the same legal structures. In many states, the legislature decides what contributions will be paid into the fund and directs how investments are made. Unlike other public funds, WRS retirees continue to share in the investment gains and losses after retirement. How do I know ETF & SWIB are protecting the pension system? • Are subject to financial and management audits by the Legislative Audit Bureau. • Are reviewed by independent consultants. • Are subject to state and federal fiduciary, tax and securities law. Does the WRS Impact Wisconsin’s Economy? *Data include Milwaukee City & Milwaukee County retirees. Can the Legislature Require SWIB to Make Certain Investments? All WRS funds are held in trust “solely” for WRS participants. SWIB investment decisions are based on the purpose of the fund. SWIB does make investments in some Wisconsin companies IF it determines those investments meet the interests of WRS participants and comply with the purpose of the fund. What are the key facts to remember? The WRS is a well-structured, well-run and well-funded pension plan. Its costs are low for all Wisconsinites. WRS retirees DO NOT receive an automatic cost-of-living adjustment increase. Instead, retirees share in the system’s investment gains and losses. Benefits are modest but initial Core Fund benefits are guaranteed for life. Retirees contribute substantially to Wisconsin’s economy. Where can I find out more about the WRS?